The bronchioles or bronchioli are the passageways by which air passes through the nose or mouth to the alveoli (air sacs) of the lungs, in which branches no longer contain cartilage or glands in their submucosa. They are branches of the bronchi, and are part of the conducting zone of the respiratory system. The bronchioles divide further into smaller terminal bronchioles which are still in the conducting zone and these then divide into the smaller respiratory bronchioles which mark the beginning of the respiratory region. A pulmonary lobule is the portion of the lung ventilated by one bronchiole. Bronchioles are approximately 1mm or less in diameter and their walls consist of ciliated cuboidal epithelium and a layer of smooth muscle. Bronchioles divide into even smaller bronchioles, called terminal, which are 0.5mm or less in diameter. 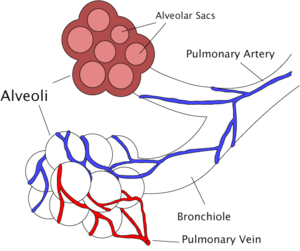 Terminal bronchioles in turn divide into smaller respiratory bronchioles which divide into alveolar ducts. Terminal bronchioles mark the end of the conducting division of air flow in the respiratory system while respiratory bronchioles are the beginning of the respiratory division where actual gas exchange takes place. The diameter of the bronchioles plays an important role in air flow. The bronchioles change diameter to either increase or reduce air flow. An increase in diameter is called bronchodilation and is stimulated by either epinephrine or sympathetic nerves to increase air flow. A decrease in diameter is called bronchoconstriction and is stimulated by histamine, parasympathetic nerves, cold air, chemical irritants and other factors to decrease air flow. The primary bronchi, in each lung, which are the left and right bronchus, give rise to secondary bronchi. These in turn give rise to tertiary bronchi (tertiary meaning third). The tertiary bronchi subdivide into the bronchioles. They are histologically distinct from the tertiary bronchi in that their walls do not have hyaline cartilage and they have club cells in their epithelial lining. The epithelium starts as a simple ciliated columnar epithelium and changes to simple ciliated cuboidal epithelium as the bronchioles decreases in size. The diameter of the bronchioles is often said to be less than 1 mm, though this value can actually range from 5 mm to 0.3 mm. As stated, these bronchioles do not have hyaline cartilage to maintain their patency. Instead, they rely on elastic fibers attached to the surrounding lung tissue for support. The inner lining (lamina propria) of these bronchioles is thin with no glands present, and is surrounded by a layer of smooth muscle. As the bronchioles get smaller they divide into terminal bronchioles. These bronchioles mark the end of the conducting zone, which covers the first division through the sixteenth division of the respiratory tract. Alveoli only become present when the conducting zone changes to the respiratory zone, from the sixteenth through the twenty-third division of the tract. 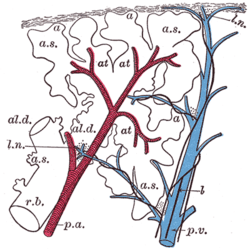 The terminal bronchiole is the most distal segment of the conducting zone. It branches off the lesser bronchioles. Each of the terminal bronchioles divides to form respiratory bronchioles which contain a small number of alveoli. Terminal bronchioles are lined with simple cuboidal epithelium containing club cells. Terminal bronchioles contain a limited number of ciliated cells and no goblet cells. Club cells are non-ciliated, rounded protein secreting cells. Their secretions are a nonsticky, proteinaceous compound to maintain the airway in the smallest bronchioles. The secretion, called surfactant, reduces surface tension, allowing for bronchioles to expand during inspiration and keeping the bronchioles from collapsing during expiration. Club cells, a stem cell of the respiratory system, produce enzymes that detoxify substances dissolved in the respiratory fluid. The respiratory bronchioles are the narrowest airways of the lungs, one fiftieth of an inch across. The bronchi divide many times before evolving into the bronchioles. The bronchioles deliver air to the exchange surfaces of the lungs. They are interrupted by alveoli which are thin walled evaginations. Alveolar ducts are distal continuations of the respiratory bronchioles. Bronchospasm, a potentially life-threatening situation, occurs when the smooth muscular tissue of the bronchioles constricts, severely narrowing their diameter. The most common cause of this is asthma. Bronchospasm is commonly treated by oxygen therapy and bronchodilators. Diseases of the bronchioles include asthma, bronchiolitis obliterans, respiratory syncytial virus infections, and influenza. The medical condition of inflammation of the bronchioles is termed bronchiolitis. Saladin, Kenneth S. Anatomy & Physiology: the Unity of Form and Function. New York, NY: McGraw-Hill, 2007.